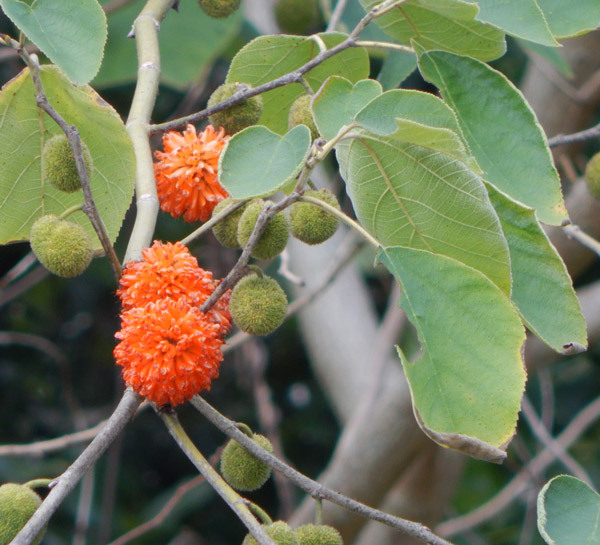 Those strange orange pom-poms are the fruit of a paper mulberry tree, also known as Broussonetia papyrifera or "HOLY MOLY!!! HOW DO I GET RID OF THIS THING IT'S EVERYWHERE!!!???" 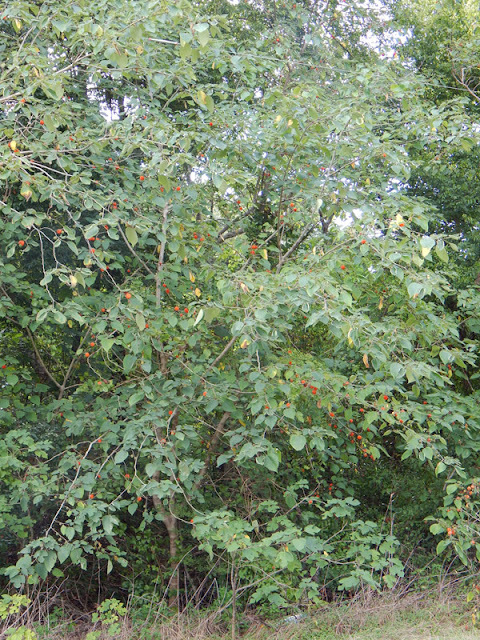 Yes, the paper mulberry is an invasive species which tends to form large colonies of trees due to its tendency to sucker everywhere. It's a useful tree in some ways. My friend Michael Adler, formerly of The Edible Plant Project, once taught a class on making rope from paper mulberry bark. The fibers are quite tenacious and make great cordage. I also like this tree for the sheer amount of rapid biomass it creates, though using it as a "chop-n-drop" tree for mulch isn't all that easy since the fibers in the wood dull cutting tools and chainsaws. Fortunately, despite its drawbacks, you can eat the fruit. Some taste better than others. I've had watery ones in the shade and quite delicious ones in the sun. Good ones are really good, with a sweet, almost mild honey-like flavor. The center of the fruit contains a pithy core and they're almost impossible to store for any period of time. Picking them right off the tree is the best. The photo above is just one tree out of a big stretch of paper mulberry trees I spotted beside the highway on Friday and photographed just for you, dear reader. Go try some fruit - they're tasty but they won't last long. Support this site: shop on Amazon using this link. It doesn't cost you a penny and it helps pay for my hosting! I have found another source for black mulberries here in the Twin Cities. When is the best time to do cuttings? I'm not sure of the very best, but I've had good luck during the summer. Germinating peach pits - again!